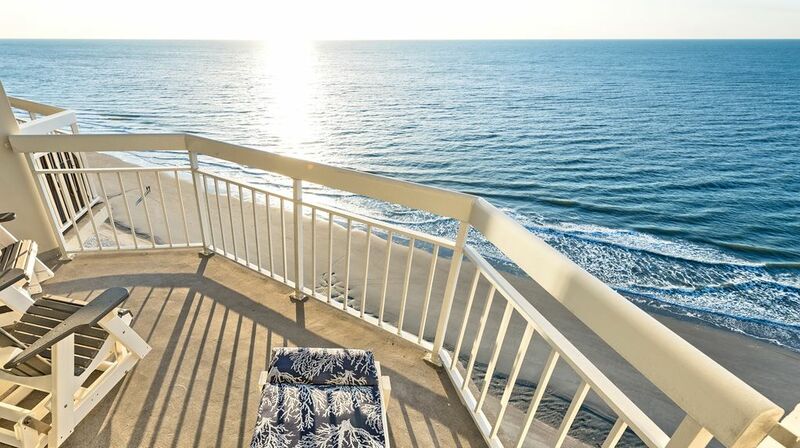 Oceanfront condos are not all the same! Our condos (#25897,#891991, #1206209) are on the top (penthouse) floor and offers spectacular views of the Atlantic ocean that you will never forget! The top floor of an all concrete building offers you privacy and quiet rare to vacation suites. Read our reviews first, then call or email to book the best vacation you ever had! We have over 15 years experience in providing our guests exactly what they want at a reasonable price. If you're looking for a clean, comfortable, quality condo in an awesome location, this is it. We know how important your vacation is to you and you can trust us to provide you with the best experience possible. This property is privately owned, managed, constantly updated and maintained. We live and work in the immediate area daily and can be at the condo in a moments notice. My weekly prices include free high speed WIFI internet, linens and parking. Click the 'Book It' button right now or contact me via email or telephone for your preferred payment option. You will not be disappointed with this property! Garden City Beach SC is about 20 min from downtown Myrtle Beach and is a more relaxed, less crowded and family oriented town with lots of things to do. Waters Edge Resort is a 15 story concrete and steel building directly on the ocean. All units have private balconies overlooking the beach and ocean. We have 5 spotlessly clean rooms; 1 bedroom, 2 full baths, a kitchen and a living area. It sleeps 4 and has a queen size bed, two queen sofa beds, a kitchen stocked with all full size modern appliances and utensils, full size washer and dryer, central heat and A/C and Color TV with remote and extended basic cable. There is a restaurant, bar, gift shop, indoor and outdoor pools, hot tubs and an exercise room on the ground floor. The two elevators are new as of 1/07. There are bars, restaurants, amusements, rides and a fishing pier, all within walking distance. Wild Water and Wheels water park is 5 min. away. Waters Edge Resort is just a step away from all Myrtle Beach has to offer: Over 100 golf courses, outlet shopping, fine dining, entertainment theaters, water parks, exciting and diverse night life. Murrells Inlet is the next town south, known as the 'Seafood Capital of the South,' features the areas best restaurants. New Movie Theater and bowling (10min), Wild Water and Wheels Waterpark (5 min), Coastal Grand Mall(20 min), The Tanger Outlets, Broadway at the Beach, Barefoot Landing, Ripleys Aquarium, the Palace Theater and much more are all within minutes of Suite 1509 Waters Edge Resort. You will not run out of things to do. We've been managing vacation properties for 15 years, married 24 years and have 2 girls, 13 and 15 years. We own/rent/manage this condo and another down the hall as a second job for both of us. Customer satisfaction is our number one goal. We love Garden City. It's a family beach. It's clean and not overcrowded. The beach and ocean are beautiful and we feel very comfortable there. The building is strong and well-made of concrete and steel. The building and it's common areas are well taken care of and the landscaping is the best in that area. The 15th floor has no noise from above and the view from the balcony is breathtaking. Penthouse floor, tons of 5 star reviews. There are two full baths and a washer/dryer. This is rare in a one bedroom oceanfront condo. We spend a minimum of 3 hours cleaning before you arrive because we want you to feel like you are the first to ever stay there. We go out of our way to make you comfortable and make your stay as enjoyable as possible. Customer satisfaction is our rule. That is unique these days. Master Bath has tub/shower. Guest bath has stall shower. Weekly rentals include sheets, pillow cases, blankets, washcloths, hand towels, bath towels and dish towels. Beach towels are not supplied. Linens available at extra cost for monthly rentals. opens to balcony which overlooks the beach and ocean. The condo itself is accessible but the bathrooms have 24" doors which will not accommodate a wheel chair. There is a lift at the indoor pool. Beautiful location! It was our first trip to this area and it was perfect for our small family. The condo is well stocked and owners clearly take pride in their home. Great food and activities are an easy walk, but the beach and pool are right there and made it hard to leave to explore. The property was absolutely perfect for our family and the view was spectacular. We loved our vacation! The location, the condo, the resort and the owners were wonderful. Anything we needed, the owners were more than accommodating. The condo was spotless, very nicely appointed, updated kitchen and very comfortable. The view from the balcony was beautiful! We would highly recommend this location! Everything was perfect. View was amazing! The pictures don't lie. The views are AWESOME! Condo was spotless. Felt @ home from the minute we walked. Loved it. Great weather, awesome condo with an unbelievable view! Our stay at Garden City was fantastic. The condo was immaculate and tastefully decorated. The view from the 15th floor is absolutely breathtaking. Owner is very helpful and professional. We will be back! A great week at Garden City Beach! 1509 Water's Edge was everything the description, pictures and reviews said it was. It was immaculate (and that is coming from a clean freak). Andy checked on us during the week to make sure everything was ok. The bedroom and one bathroom are small but doable for a week at the beach. I would highly recommend this condo. Kids love The Garden City Pier, Arcade and rides. They are in walking distance. Wild Water and wheels Water Park is less than 2 miles away. Brookgreen Gardens is a must see and is only a 15 minute drive. Many seafood restaurants, deep Sea fishing, creek fishing, jetski rentals and para-sailing are a ten minute drive away in Murrells Inlet, SC. Fabulous shopping at the factory outlets is only 30 minutes away. There is so much more. You will not run out of things to do here.